We explain what coordinates are and how children are taught to read and plot coordinates on a grid. Coordinates are numbers which determine the position of a point or a shape in a particular space (a map or a graph). 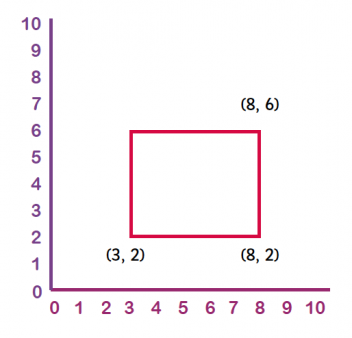 In primary school children are taught Cartesian coordinates, which they are introduced to in Year 4. Points are marked by how far along they are on the x axis (the horizontal axis) and how far up they are on the y axis (the vertical axis). The coordinates of the left-hand corner of this triangle are (1, 3). Coordinates are always written in brackets, with the two numbers separated by a comma. 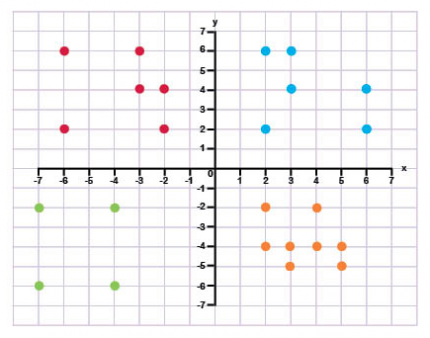 Coordinates are ordered pairs of numbers; the first number number indicates the point on the x axis and the second the point on the y axis. When reading or plotting coordinates you always go across first and then up (a good way to remember this is: 'across the landing and up the stairs'). Children start to learn about co-ordinates in Year 5. 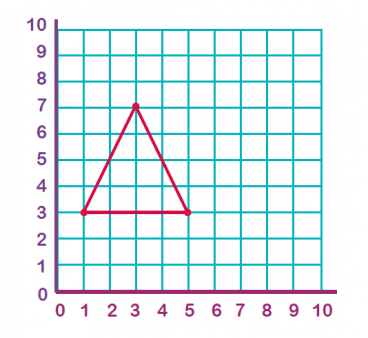 For example: they may be shown the above triangle and asked to write the three coordinates for the three vertices of the triangle. This would constitute reading coordinates. They may then be given a blank grid and asked to plot the following coordinates: (1, 1) (4, 1) (1, 3) and (4, 3) then join up the points to make a shape (which in this case would be a rectangle). The square's coordinates are (3, 3), (5, 2), (6, 4) and (4, 5). They may also be asked to reflect, rotate or translate a shape on a coordinates grid and then give the coordinates of the new shape they have drawn. In this case the unmarked coordinates are (3, 6).